Love the fact he’s wearing a coat and a hat. The disguise fooled me. Took me a second to spot him. That’s some strange chick sitting next to you! Haha, free drinks for patrons with beaks! The highly evolved Bar Bird. That bird must have a high tolerance! It think he’s in every bar at all times! Put it on his bill. 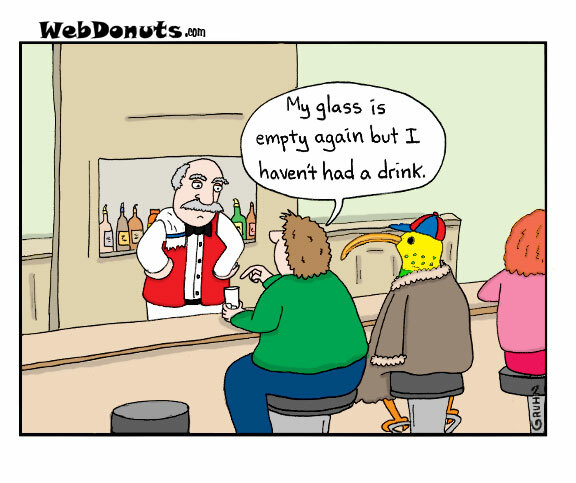 Drinking bird is a drinking glutton. Free drinks are the order of the day. At a drinking bird party I wonder who pays? Maybe you should be stop looking away from your glass.